Here's How You Can Enjoy The Most Soothing & Relaxing 5-Star Spa-Grade Bath At Home! How many times have you been frustrated by rough and scratchy bath sponges? We are here to put an end to this by offering you the SOFTEST and MOST SOOTHING bath body sponges ever! Introducing The Ultimate Soft Body Sponges Set For Men, Women & Kids By Valiry! Our premium soft sponges are finally here to offer you a rejuvenating and gentle experience, while cleansing, exfoliating and massaging your sensitive skin. Your Sensitive Skin Deserves A Sensitive Sponge! Don't Leave Home Without Your Soft Sponges! Now you don't have to settle for all those flimsy hotel sponges anymore, since you can easily pack our soft and lightweight sponges in your backpack or suitcase and enjoy a skin-soothing and rejuvenating shower everywhere! The Most Gentle Sponges For The Whole Family! Whether you're looking for a soft andvelvety bath sponge for your wife, girlfriend, husband, boyfriend or children, the Valiry delicate sponges set is your clear choice! Extra Large Size -Our elite bath sponges are larger than usual (5.5" x 4.2" x 2.5") in order to cover a larger area of your body. Rich Soothing Lather -The Valiry soft bath sponges will lather up really well, thus allowing you to enjoy an invigorating experience. Handy Hanging Rope -The convenient hanging rope will allow your soft bath sponges to dry up faster than usual! Click "Add To Cart" NOW & Surprise Your Skin! WHEN WAS THE LAST TIME YOU ENJOYED A SPA-LIKE BATH AT HOME?Now you can indulge yourself in the skin-soothing and rejuvenating experience of a true 5-star spa bath with the Valiry premium bath body sponges for men, women and children! The ultra-soft and gentle design of our bath sponges will allow you to relax and unwind after a long hard day at work. CLEANSE, REVITALIZE & MASSAGE YOUR WHOLE BODY with the softest foam bath sponges available. By creating a rich lather, our luxury bath sponges will help soothe your sensitive skin while gently exfoliating your epidermis and removing dead skin cells without causing skin irritations. Your delicate and sensitive skin deserves a soft bath sponge. YOUR SKIN WILL BE SOFT, SMOOTH & REJUVENATED AFTER EVERY BATH, since our bath sponges for adults and kids will help you wash and massage your sensitive skin while the fluffy foam will protect and hydrate you. And unlike cheaply-made large bath sponges that scratch or hurt your sensitive skin, our exclusivebubble bath sponges are the softest available. LOOKING FOR A THOUGHTFUL GIFT FOR YOUR WIFE, HUSBAND OR KIDS? 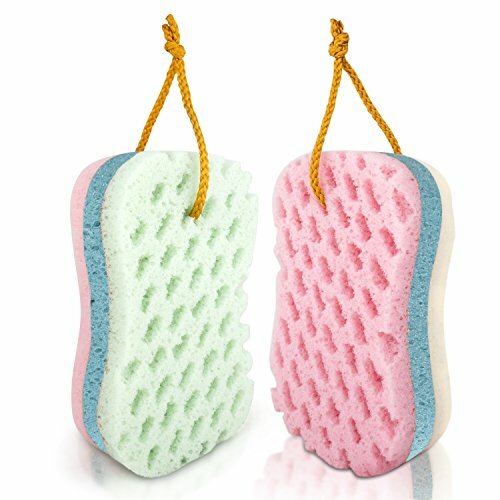 Surprise your loved ones with our soft sponges set for boys and girls, which contains 2 durable, lightweight and fast-drying 5.5"x 4.2"x 2.5"bath sponges. Plus, the eye-catching pastel color combination and handy hanging rope will surely impress everyone! What are you waiting for? 100% SOOTHING & REJUVENATING BATHS OR YOUR MONEYBACK!That's our unconditional guarantee!Our mission is to help you enjoy the little things in life as much as you can. That's why we have designed this ultra-soft, extra-large and gentle bath body sponges and back them with a 100% satisfaction guarantee! If you're not thrilled with them, we'll offer you a prompt and full refund! No questions asked! If you have any questions about this product by Valiry, contact us by completing and submitting the form below. If you are looking for a specif part number, please include it with your message.